MFA recently donated $25,000 to the MS Agriculture and Forestry Museum Foundation to renovations to the forestry exhibits at the museum. Joe Mallard of Jackson recently began his term as the 2019 President of the Mississippi Forestry Association. Mississippi Forestry Association is pleased to announce Drew Massey of Noxapater as the 2018 Outstanding Logger of the Year. Mississippi Forestry Association named E.J. Dennis of Ellisville as the 2018 MFA Outstanding Tree Farmer of the Year. 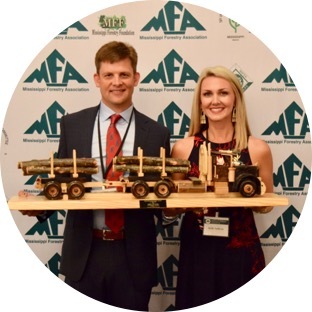 Mississippi Forestry Association named Representative C. Scott Bounds and Senator Jenifer Branning, both of Philadelphia, Mississippi, as the recipients of the 2018 MFA Outstanding Legislator Awards. Mississippi Forestry Association named Gary Blair of Brookhaven as the recipient of the 2018 MFA Meritorious Service to Forestry Award. Mississippi Forestry Association named Mallory Moore of Baldwyn as the 2018 MFA Teachers Conservation Workshop Alumnus of the Year. 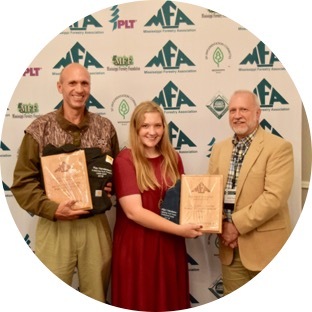 Mississippi Forestry Association named Heath Lollar of Mantachie as the 2018 MFA Outstanding Youth Forestry Achievement Award recipient.